Anthem is one of the largest health benefit companies in the US. It has 37,000+ employees and assets of $59B. The company frequently hires work from home employees and is regularly listed as a top employer for telecommuting. 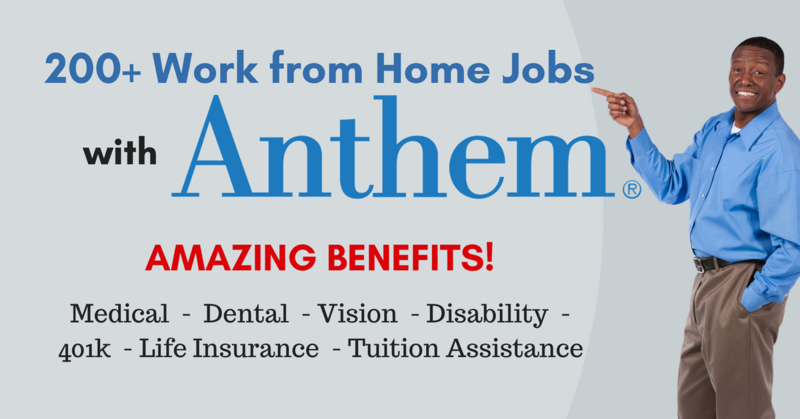 A current search for work from home and telecommuting positions yields over 200 jobs, with benefits, including Credentialing Specialists, Nurses, Pharmacy Operations, Reporting & Data Analysis, Actuarial, IT, Management, Legal, Analysts, and many more. Disability Benefits – Short-term disability at no cost to you if you are unable to work as a result of a covered illness or injury. Employee Assistance and Work/Life Program – Professional assistance with personal problems, as well as child care/elder care referral services. Programs to Improve Your Health – Onsite health services and screenings; tobacco cessation support; weight management programs; newsletters; tools; databases; health and fitness centers at many locations; and quarterly fitness club reimbursement for associates without access to an onsite fitness facility. Flexible Spending Accounts – Health Care and Dependent Care with a 10% company match on your contribution to the dependent care FSA. Tuition Assistance – Anthem, Inc. can provide up to $5,000 in tax-free reimbursement each year to cover the cost of tuition, required fees, and textbooks at an accredited institution. * For more on company benefits, click here. To access the jobs, click here and select “Nationwide” under “Location Type”. You can find others by searching with keywords (without quotes) “work from home,” “[email protected]” and “telecommute.” It takes a little digging, but there are many to choose from. To see more jobs like these, check our Newest Jobs & Gigs page. To be the first to hear about jobs like these, like our Facebook page and check your feed for our posts. Good luck! This entry was posted in Hiring Companies, Jobs with Benefits, Work at Home Jobs and tagged Anthem. Bookmark the permalink.